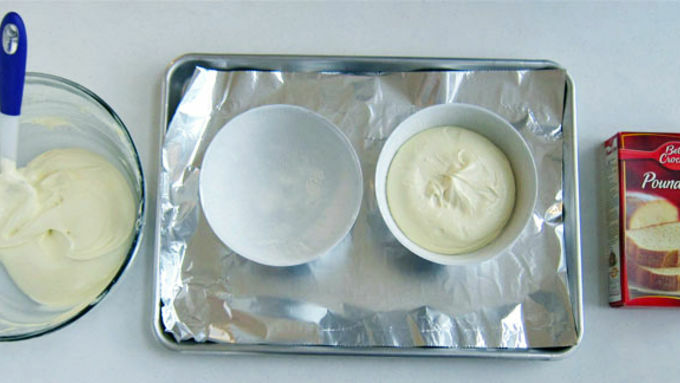 Grease the inside of both halves of your sports ball pan generously with shortening. Dust liberally with flour. Turn pans upside down and tap out excess flour. Make pound cake according to package instructions. Pour half of the batter into each pan. Set pans on metal rings on a baking sheet. Bake cakes for 35-40 minutes until the tops are golden brown and a toothpick inserted in the center of each cake comes out clean. 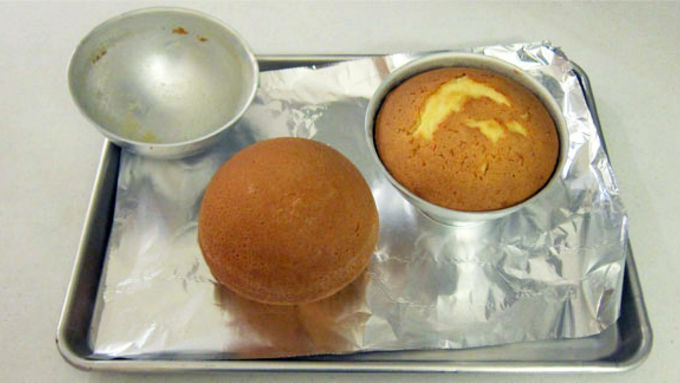 Allow cakes to cool for 10 minutes, then remove from pan. Let them cool for 20 minutes, then place in the freezer for an hour. While the cakes are chilling, get your frosting ready. Color two tubs of the Betty Crocker White Frosting blue using Betty Crocker gel food coloring. Color half of the remaining tub of frosting green using a few squirts of the green gel food coloring and a few drops of red. Cover the frosting until you need it. 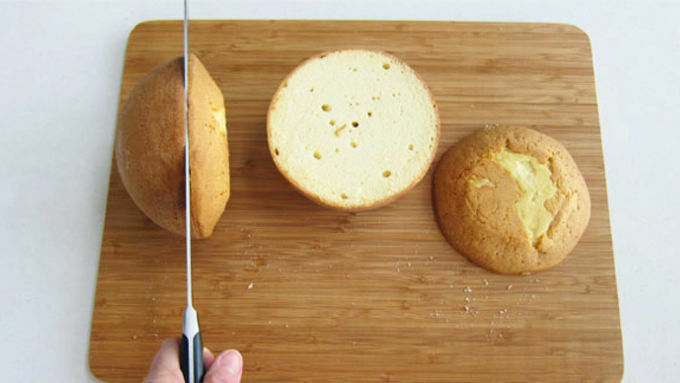 Cut cakes into two sphere halves, removing the part of the cake that puffed up during baking. Cut a 4 1/2 inch round out of each of the scrap pieces of cake. Cut a 2 1/2 inch circle out of the center of each of those rounds. 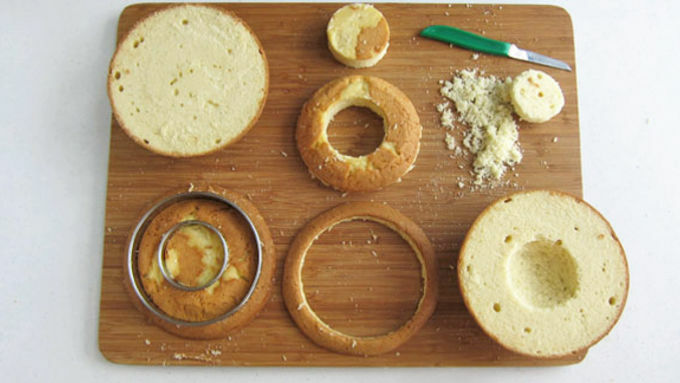 Cut and dig out a 2 1/2 inch round well in the center of each cake. 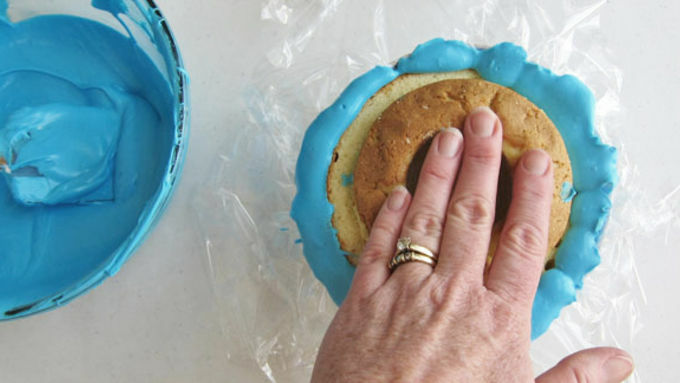 Use a dab of frosting to attach one cake ring on top in the center of each half sphere cake. Line cleaned sports ball pans with two layers of plastic wrap. 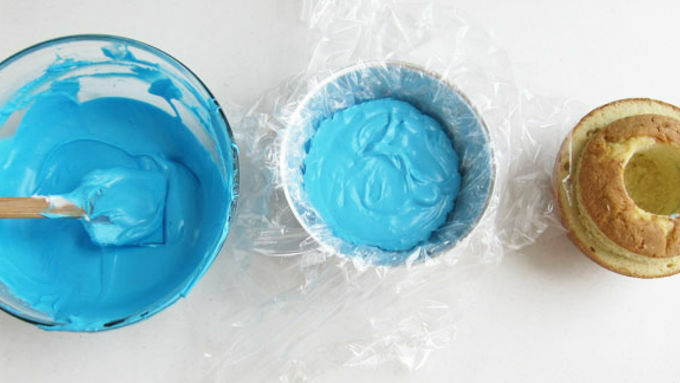 Color two tubs of frosting ocean blue. Heat on high power in the microwave for three 10 second increments, stirring after each until smooth and pourable. Pour half of the frosting into each pan. Press one cake into each pan allowing the frosting to ooze up around the edges. Scrape off excess frosting, making the frosting and cake level with the edge of the pan. Freeze cakes for at least 30 minutes. Remove cakes from freezer and use a serrated knife to level each cake, removing any frosting and cake that rises above the edge of the pan. 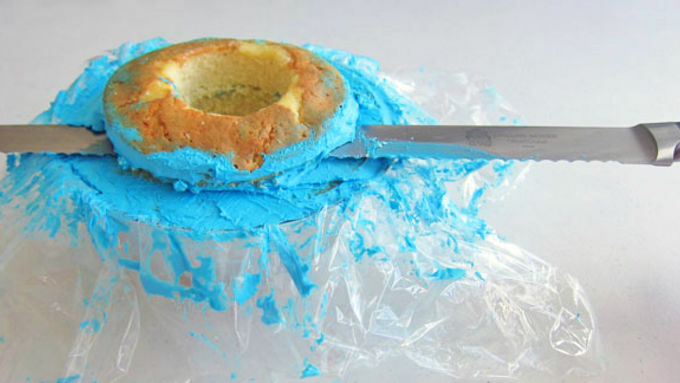 Lift plastic wrap out of pans and peel it off cakes. Set one cake cut side up on a metal ring from the cake pan set. Fill the well in the cake with chocolate rocks. Add a thin layer of frosting around the edge of the cake. Pour chocolate rocks into the well in the second cake, leaving a 1/2 inch of room at the top. Cut a 1/2 thick slice from one of the 2 1/2 inch round cake pieces. Frost around the edge of the cake and set it in the well over the candy to plug up the hole. Carefully lift the cake, turn it upside down, and set it on top of the bottom cake. 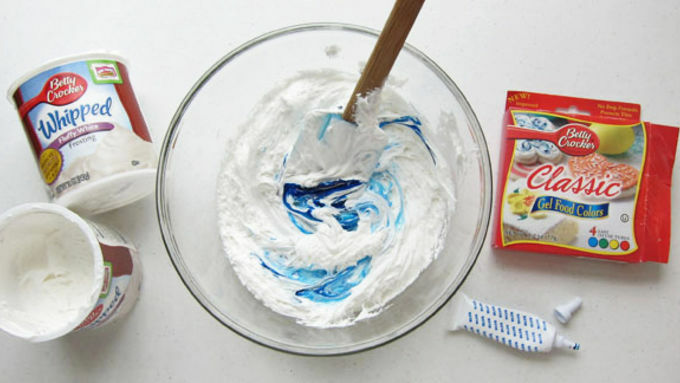 Smooth out the blue frosting, making it look like waves, if you prefer. Add some spots of white frosting around the globe. Color half of the remaining white frosting Earth green, pipe it on the cake to create continents. 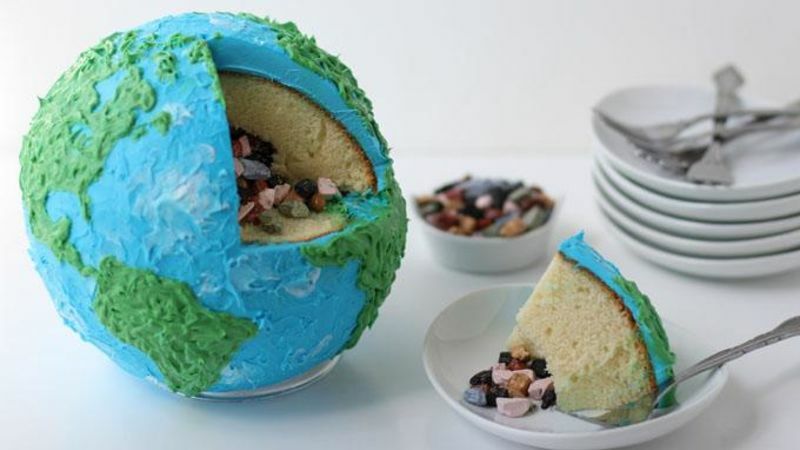 Celebrate Earth Day with an Earth-shaped cake filled with candy. Earth Day is April 22nd and I wanted to share my enthusiasm for our planet by baking a cake in its honor. 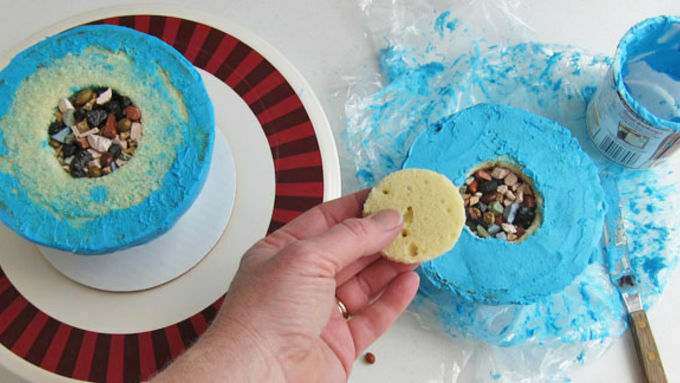 And not just any cake – a candy-filled cake that looks like our dear Earth. Now, I won't say this was an easy cake to construct. 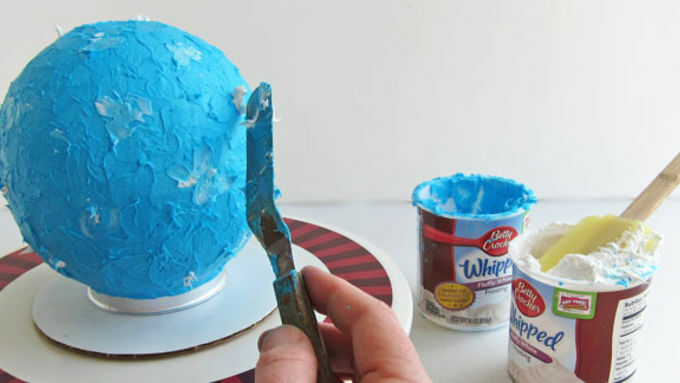 But as I worked, I devised a method of leveling and frosting my spherical cake that will surprise you and made this project go very smoothly! 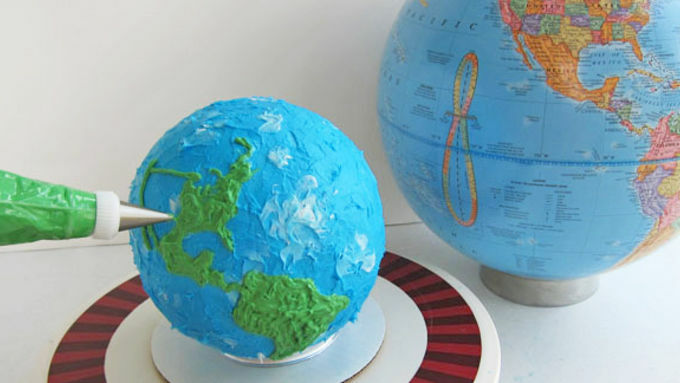 If you make an Earth cake, be sure to grab a globe to use as a guide. I think it would have been a struggle to create the continents on the cake if I had used a flat image of a map instead. I could follow the shape of the globe as I piped on the continents and did a pretty good job of fitting them in the right spots. I brought my finished cake over to my neighbors, and was so happy to see such enthusiasm from the kids. Not only were they excited to get some cake, they loved that it looked like Earth– and were amazed to find chocolate rock candy inside! Happy Earth Day!